Last year, Husbie and I went through so many ups and downs, and the saddest part being when our darling dog passed away. We've been looking to the future, appreciating our time with her, and together... and setting up new beginnings for 2012. How lovely is twentytwelve already? New Beginnings indeed. SO! We looked around a bit, our friend with two dogs came close to leaving one with us. A shelter dog came around to visit. And I looked over some foster dog care websites. Husbie visited a really scared (and scarred) Staffy who didn't really respond to him... but it was my MUM reading the local paper who spotted our new friend. Before she arrives, I got crafting! 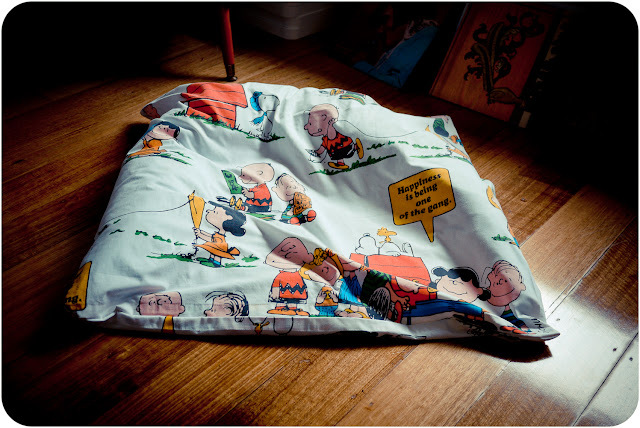 Then I just made a big slip of this darling Charlie Brown bedsheet, and voila, a dog bed. 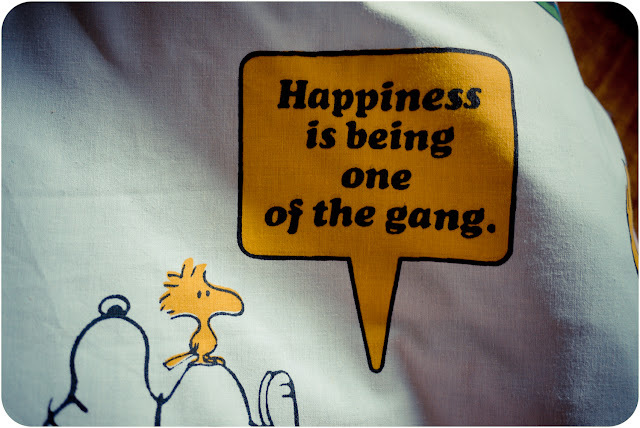 And we're looking forward to welcoming our new friend to our gang. Bless! 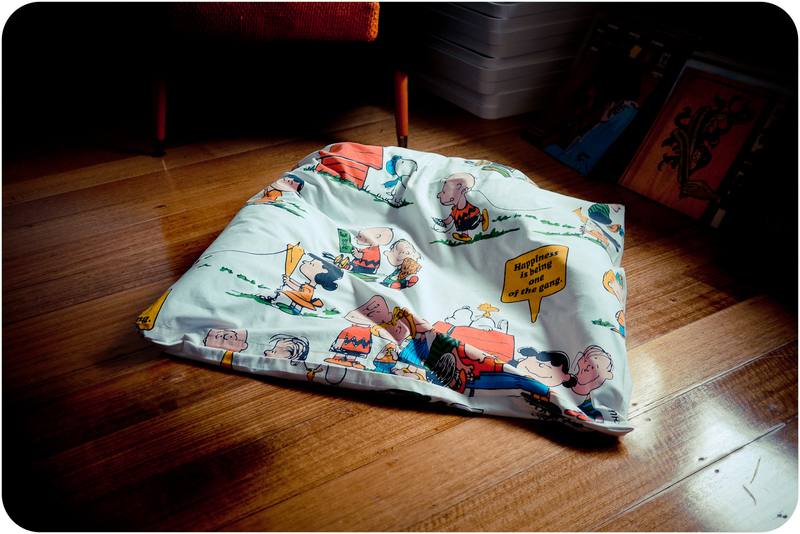 I had those sheet when I was a kid. Great choice to welcome a new furry friend. Oh, I love the Charlie Brown sheets!! I love Charlie Brown a whole lot, actually! LOL! Congratulations on your new furry addition to the family! Cannot wait for photos! Simply adorable! 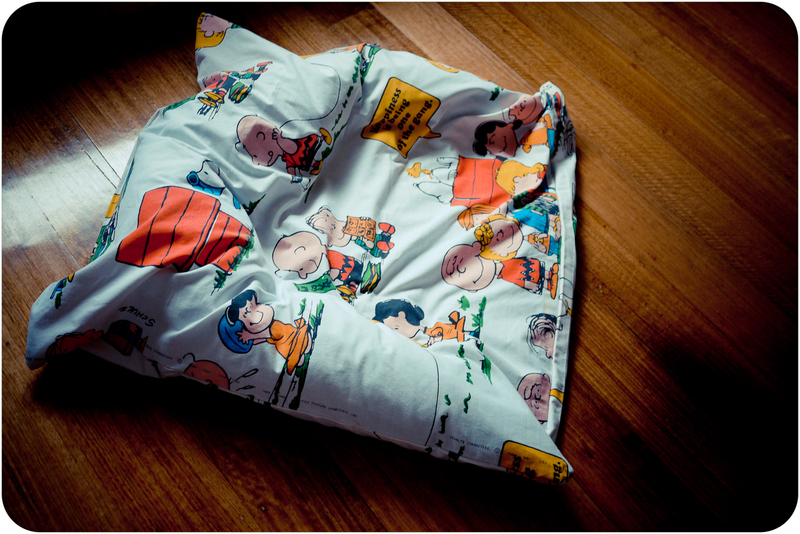 Love those Charlie Brown sheets too:) Can't wait to meet the new member of the gang! Very cute! Congratulations on your new little friend! What a happy occasion! I'm sure your furry new friend will adore her fab new bed! I'm looking forward to seeing her here! 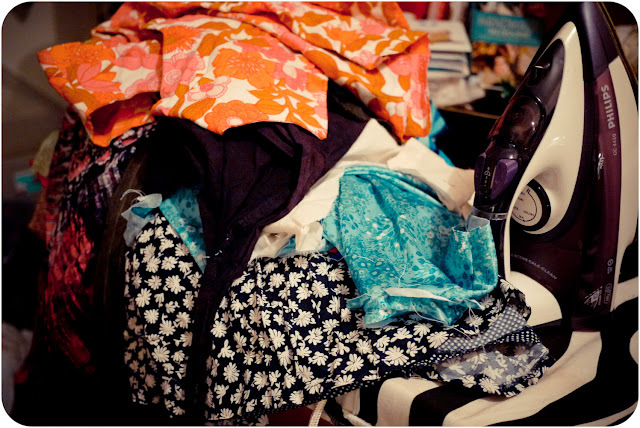 I hope that Staffy you mentioned finds a loving home with someone they feel comfortable with. YAY! So wonderful! I can't wait to meet your new friend! That's excellent news - giving a new furry friend a forever home is a wonderful thing, especially when the new owners have so much love to give. Can't wait for the "introduction" post. haha-I have these sheets! They were my brother's long ago. So fun to make them into a dog bed. Enjoy your new friend. We love our labradoodle. Dogs are the best! 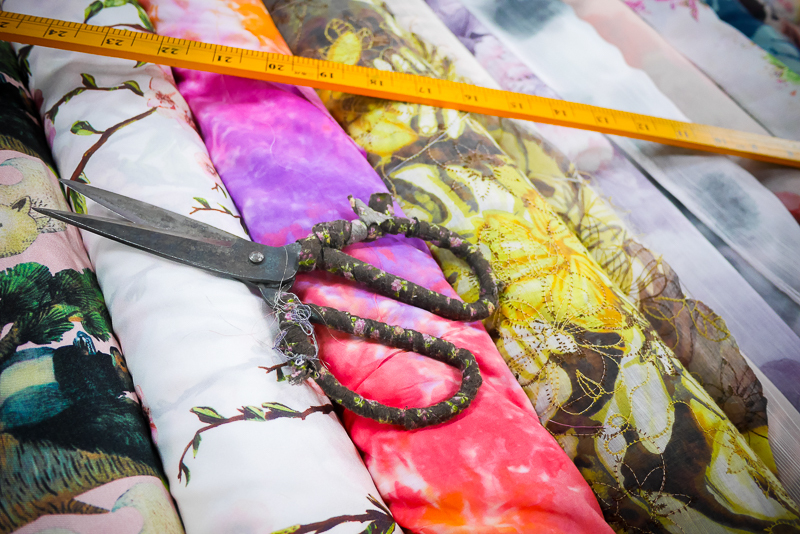 I've been holding onto the sheets for ages for the perfect project! Voila! Yay! I'd love to make a doggie bed for my pup... but he will only sleep on my bed! I'm so glad you're getting another K9 member of the family. I've never been able to go straight to another hound and have always had to leave it at least a few months. I can imagine the excitement and the fun you're going to have! That’s just so sweet! You made a bed for your new furry friend. I know how hard it is to lose a pet but that’s just how life is, constant goodbyes. Anyway, do you have a new pet already?